The SPAD S.VII was the first of a series of highly successful biplane fighter aircraft produced by Société Pour L'Aviation et ses Dérivés (SPAD) during the First World War. Like its successors, the S.VII was renowned as a sturdy and rugged aircraft with good climbing and diving characteristics. It was also a stable gun platform and was flown by a number of the famous aces, such as France's Georges Guynemer and Italy's Francesco Baracca. SPAD began development of a single-seat tractor biplane in early 1915, known as the S.V. It was powered by the newly developed 8Aa 8-cylinder Vee engine from Hispano-Suiza, which supplied 150 hp (112 kW) and enabled the aircraft to reach 119 mph (192 km/h). The French Air Service was sufficiently impressed with the performance of the prototype when it first flew in April 1916 that an order was placed for 268 aircraft. The production model was designated the S.VII. Later aircraft were fitted with the 180-hp (134 kW) 8Ac engine. The engine's only flaw was that it was prone to overheating. 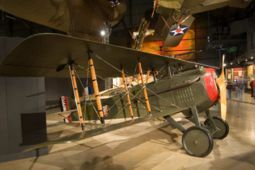 The S.VII entered service in August 1916 with Escadrille No. 26, and the first victory achieved by the type came on 23 August by French pilot Armand Pinsard. The Royal Flying Corps initially refused to adopt the S.VII because of a series of fatal crashes due to airframe failures, but it was later accepted and S.VIIs were even built under licence at Brooklands. Later, in 1917, the S.VII was also employed by the United States Army Air Service of the American Expeditionary Force, though mainly as a trainer. In 1917, Guynemer called for an improved version from SPAD which led to the development of the S.XII and ultimately the S.XIII, which was one of the most successful fighters of the war. This page was last edited on 6 March 2007, at 21:54.